Have I ever mentioned how much I LOVE September? It is my month! It contains my birthday and the start of my favorite season, autumn. Oh and, it is the beginning of apple season! While some of my friends are jumping into the pumpkin spiced everything season, I’m putting that on pause until October, so I can enjoy apple season first. After a summer of eating stone fruit and berries, my kids are ready for apples. It seems as if they have an internal apple season radar that lets them know when apple season begins. Just last week, I got my first, “Mommy, can we get some apples for our lunch?” Sure thing, kiddos! Doll’s Orchard is in Oldenburg, Indiana—just about halfway between Indianapolis and Cincinnati. They are family owned and operated. All their apples are harvested by hand and washed before sent out to market. They grow a wide variety of apples on their orchard and this past week we’ve been enjoying their Gala, Ginger Gold and McIntosh for eating out of hand, and their 4-pound bag of juicing apples when the kids and their dad make a big batch of “leftover fruit and veggie” juice. 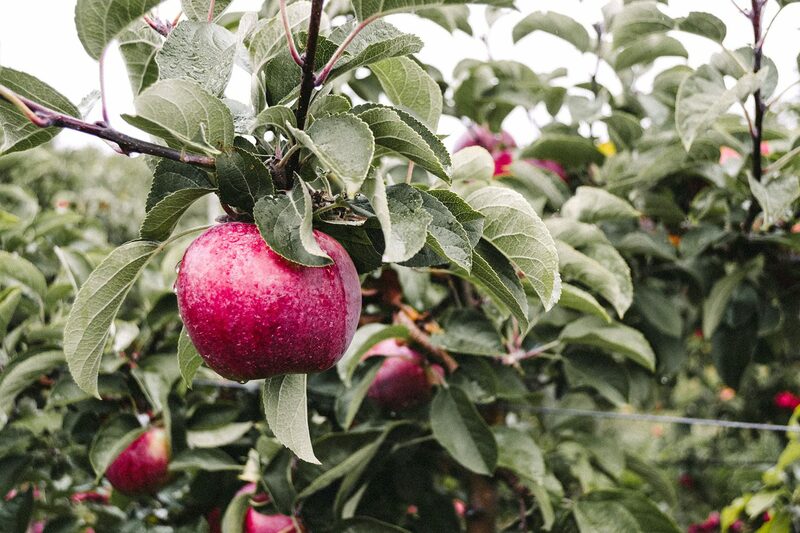 As the month of September rolls on, more and more US grown apples will start to make their debut in the market. 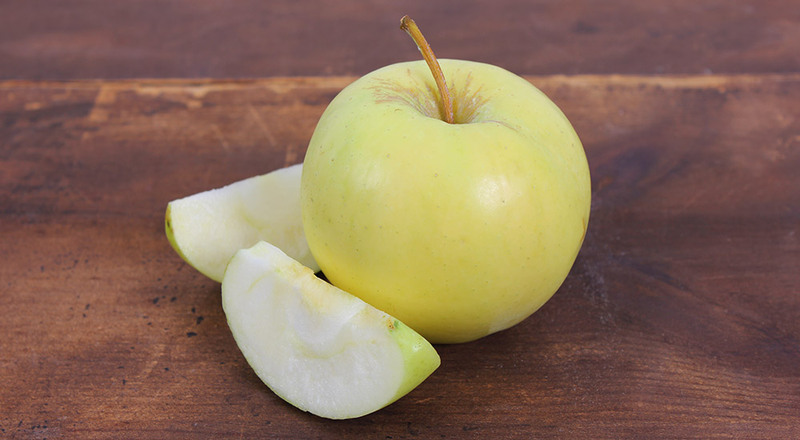 Like this week, we have Gala, Ginger Gold, and Paula Red apples coming from our friends to the north in Michigan. Both of my boys are what we call “fruit monsters,” especially the older of the two. They would eat only fruit for breakfast, lunch, and dinner if I let them. I know there could be worse problems than your kids wanting to eat fruit all the time, and I definitely use it to my advantage because they will easily accept fruit as a special treat. Nearly every lunch I pack for my middle child has fruit as a component of the meal and a small container of Omena Organics unsweetened applesauce for his special treat. My littlest fruit monster is still learning how to navigate utensils, so I just poke a hole in the foil top and stick a thick silicone straw in the applesauce and he drinks it up. Omena Organics is in Omena, Michigan on the Leelanau peninsula. 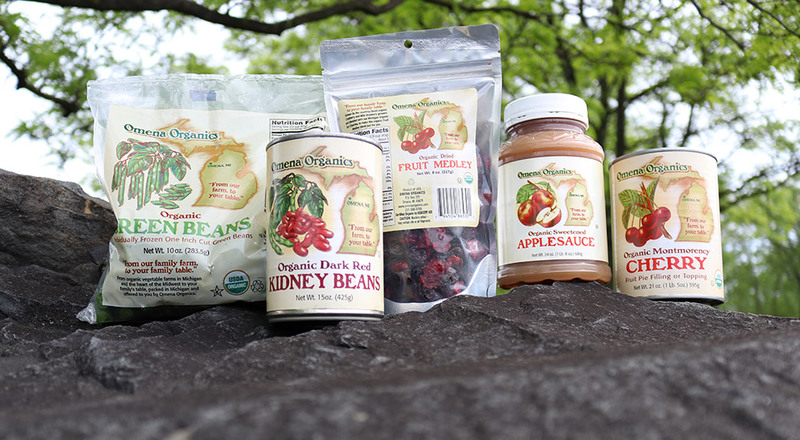 They are three generations of fruit farmers that provide certified organic products that are frozen, dried, and canned. We carry a large variety of their products from canned beans, frozen cherries, applesauce, and apple juice just to name a few. Their single serve applesauce and apple juice are perfect for lunch boxes. They offer both sweetened and unsweetened applesauce in individual servings and 23-ounce jars. Although, I prefer the unsweetened, you can rest assured, if sweetened is the route your family takes, there are no corn syrups used—just organic sugar. Their juices are made without any added sugar, and they have two special juice varieties that are out of this world—Honey Crisp Apple Juice and Pumpkin Spiced Apple Cider (two of my favorite fall flavors in one!). With the anticipated rainy weather coming this weekend, we are going to be inside making Gluten-Free Fried Apple Rings. 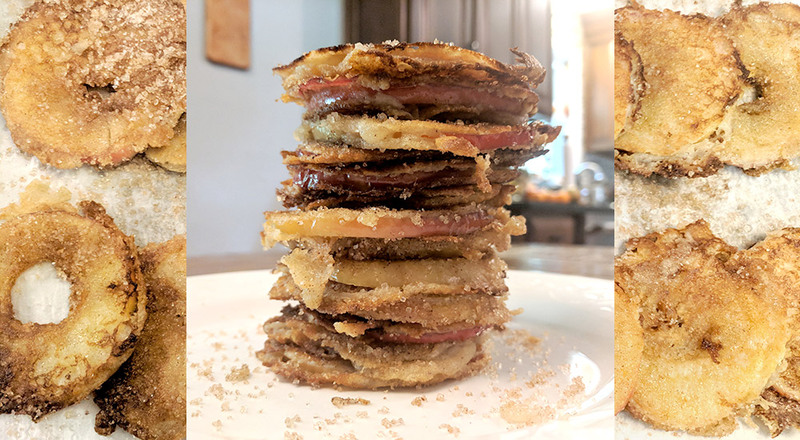 This recipe uses the gluten-free all-purpose flour recipe I posted last week and local apples from Indiana and Michigan.